﻿ Irish Film Institute -WIN A DVD BUNDLE WITH A LATE QUARTET! WIN A DVD BUNDLE WITH A LATE QUARTET! We’re delighted to offer a fabulous DVD bundle (containing A Winter’s Bone, Animal Kingdom and Orlando) as the prize in our competition celebrating A Late Quartet, which screens at the IFI until April 25th. Courtesy of Artificial Eye. To be in with a chance of winning, simply answer the question below and submit your details before midnight, Thursday April 18th! 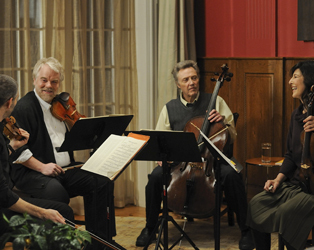 Which position does Philip Seymour Hoffman’s character Robert play in the string quartet? Need a hint?